Six buttery cookies baked from delicious shortbread, iced by hand then printed with your full color design or logo. Individually wrapped in a gold rim gift box. Individually cello wrapped, in a gold-rimmed box. A wonderful gift for employees, clients or colleagues. 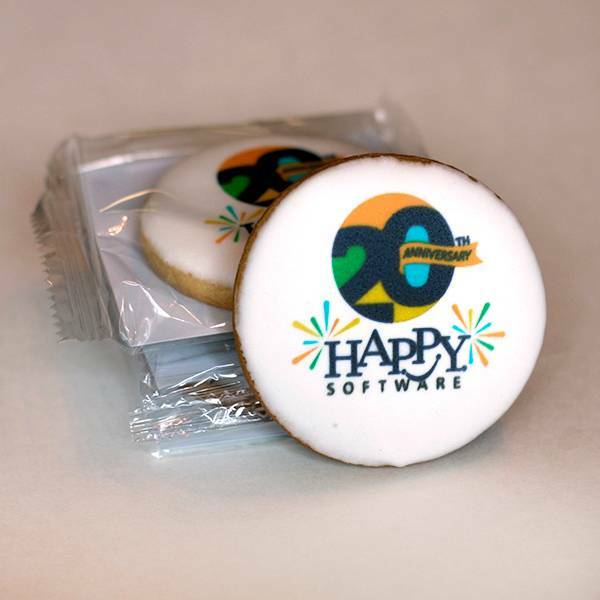 Full color printing in 100% edible ink allows you to capture your logo and brand right on the cookie. Six delicious shortbread cookies, buttery and baked to the perfect crunch. Sugar icing adds sweetness and provides a white backdrop for bright colors to shine. Each cookie is individually wrapped for freshness, then placed in a gold rim box with a clear top to showcase the gift. If you need these shipped to multiple locations (drop shipped), either with different delivery days or for simultaneous delivery, or if you want to include marketing materials or a business card, fill out a Request Estimate form.